The Statue of Liberty in New York City may be a famed symbol of immigration, but many immigrants view the Gateway Arch as a beacon welcoming them to their new home. Since the founding of St. Louis, the city has been a new home to immigrants settling in St. Louis neighborhoods—from German Dutchtown to the Italian Hill. Today, immigrants from across the world continue to make St. Louis home, and many are greeted and treated by Brook Raye and her colleagues. Raye is a nurse practitioner for St. Louis Institute for Family Medicine, a non-profit healthcare provider offering radically subsidized costs for those without health insurance. With locations throughout St. Louis, the Institute meets those in need in their own neighborhoods. In South City, Vietnamese refugees have found hope for new beginnings after experiencing horror in their homeland. In the heart of the population sits the Vietnamese Clinic at Catholic Charities South Side. It is where Raye provides primary care and helps the patients navigate the healthcare system. Raye also welcomes new immigrant and refugee students from more than 23 countries to their first school in the United States. Two days a week, Raye serves as a primary care nurse practitioner at the Nahed Chapman New American Academy assisting in the children’s transition to a new healthcare system and providing treatment as needed. Down the road, Raye also provides screenings and vaccines to preschoolers at South Side Early Childhood Center, a head start program offering preschool to children from families that can’t afford private education. 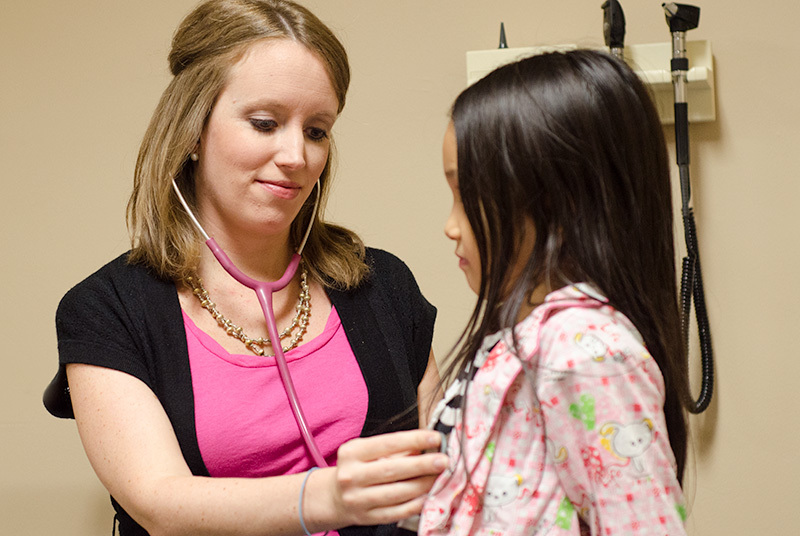 For Raye, becoming a nurse practitioner was not always the plan. When Raye began her biology degree at Missouri Baptist University, she knew she wanted to do good in the world. As she progressed throughout her studies, she realized that God was calling her to become a nurse practitioner. Raye then completed an intensive fast-track graduate program at Vanderbilt University to follow her calling. Upon graduation, Raye was determined to serve her hometown. Raye was ecstatic when she discovered the St. Louis Institute for Family Medicine. The organization’s purpose perfectly corresponded with her reasoning for becoming a nurse practitioner. Raye’s heart was so devoted to the mission that she volunteered her time to the Institute. Months later, she sacrificed a more lucrative full-time position to work in the heart of South City. The pay is less and standard supplies scarce, but working for the nonprofit is well worth the sacrifices, she believes. While serving in third-world countries still tugs at Raye’s heart, she has an important mission to serve within her South City community. This story was originally published in “Our City,” a feature in the Winter 2015 edition of MBU Magazine.